UPDATE 9-29-18: Jackie Dupras has been found, deceased, near her home in West Seattle. See update. 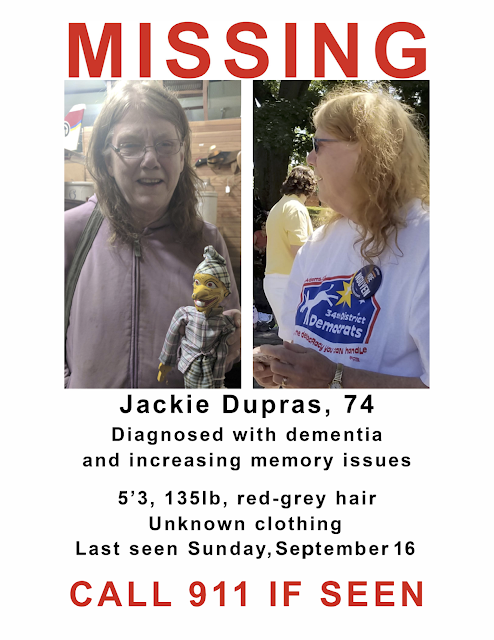 MISSING: Jacqueline Dupras, 74. Diagnosed with dementia and increasing memory issues. 5'3", 135 lbs., reddish grey hair, green eyes. Unknown clothing description. Last seen Sunday a week ago in West Seattle. The only lead the police and family have received is that she may have boarded a bus headed for Pioneer Square that ends its route at Shoreline Community College. She’s a fast walker, and could have traveled far from home in the week she has been missing.